Deafness and Hearing Loss - body, causes, What Is Hearing? Deafness is the partial or complete loss of hearing. Hearing loss and deafness may be present from birth, as a result of many possible causes, or may begin later in life as a result of age-related changes in the ear, disease, injury, or excessive exposure to noise. Kathy Peck was a guitarist in the 1970s and 1980s in a rock band known as the Contractions. They played a mix of punk and new wave music in San Francisco and toured across the United States. The band gained some critical and popular success, playing shows with such groups as Duran Duran. But in the mid-1980s, Peck realized she was losing some of her hearing. All those years of playing loud music and attending concerts had damaged her ears, as had happened also to musician Pete Townshend of the Who. When Kathy Peck and F. Gordon, M.D., attended an especially loud concert in 1988, they decided to make a difference. They started H.E.A.R. (Hearing Education and Awareness for Rockers), a group that aims to prevent hearing loss among musicians and their fans. H.E.A.R. Anatomy of the ear. As sound waves travel through the ear, they are converted into electrochemical messages that are sent along more than 30,000 nerve connections to the brain. The brain then interprets these messages as words and other sounds. promotes wearing earplugs to reduce loud music to a level that does not damage the ear. Rock music is not the only cause of noise-related ear damage: excessive exposure to power tools and other forms of machinery is one of the most common causes of deafness and hearing loss in the United States. Overall, more than 28 million Americans have some form of hearing loss. Hearing depends on the ability of sound waves to travel through the various parts of the ear. As sound waves travel through the ear, they are converted into electrochemical messages that are sent along more than 30,000 nerve connections to the brain. The brain then interprets these messages as words and other sounds. Sounds actually are waves of energy that move through the air. Sometimes it is even possible to feel them, as when a hand is placed for a few moments next to a loudspeaker. The pinna * is the fleshy, visible part of the outer ear that captures the sound waves. It directs sound waves down a short tunnel, called the ear canal. 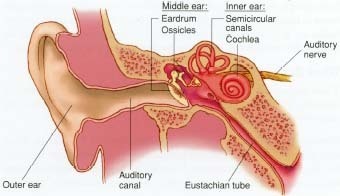 The canal ends at the eardrum * , which vibrates when sound waves reach it. The vibrating eardrum causes the bones (ossicles * ) that are connected to it to begin vibrating as well. The ossicles are three tiny bones in the air-filled middle ear. As the bones move, the sound waves are transferred through another thin layer of tissue into the inner ear. The most complex action in the ear occurs in the inner ear, deep within the skull. The sound waves first enter the cochlea, which contains liquid and is lined with cilia (tiny strands of hair). The liquid in the cochlea begins to vibrate and causes the microscopic hairs to move, too. The movement of the hairs stimulates nerves that are connected to the brain, which interprets the signal as a particular word or sound. People with total deafness can hear no sounds at all. Others have partial deafness, which means they may have trouble hearing certain sounds unless someone is speaking close to them. Some people slowly start to lose their ability to hear, and the problem gets worse as time passes. Hearing loss may be temporary, such as when ear wax * builds up. If the wax is removed properly by a health professional, hearing returns. But some forms of total or partial hearing loss are permanent. There are basically three types of hearing loss: conductive, sensorineural (sensor-i-NOOR-al), and a mixed form that combines conductive and sensorineural hearing loss. Pinna (PIN-na) is the medical term for what most people mean when they say "ear": the part of the ear that protrudes from the head and is used to hold up eyeglasses and to wear earrings. Eardrum (tympanic membrane) is the thin, flexible layer of semi-transparent tissue that forms the dividing wall between the outer ear and the middle ear. Ossicles (OSS-i-kulz) are the three smallest, most delicate bones in the body: the malleus (MAL-ee-uss) looks like a hammer; the incus (ING-kuss) looks like an anvil; and the stapes (STAY-peez) looks like a stirrup. Cochlea (KOKE-lee-a) is the organ of hearing that resembles the shell of a snail. Cilia (SILL-ee-a) are the delicate hairs in the inner ear. * earwax, also known as cerumen (se-ROO-men), is the waxlike substance in the ear that traps dust and other particles to prevent them from damaging the inner ear. Damaged eardrums: Sometimes the eardrum gets a tear or hole in it, which causes it to lose some or all of its ability to vibrate properly. Such damage may occur if a cotton swab or other object is placed too far inside the ear; if an explosion or gunshot or other extremely loud sound occurs too close to the ear; or as a result of an ear infection, a head injury, or a sudden or extreme change in air pressure. Abnormal bone growth: The ossicles (OSS-i-kulz) are the tiny bones in the middle ear that work together in a very small space to conduct sound from the ear drum to the inner ear. If they grow too much or too little or are damaged, they cannot do their jobs well. This problem may be present from birth or it may occur as children grow. The composer Ludwig van Beethoven (1770-1827) created some of music's most important symphonies even though he spent most of his life struggling with hearing loss and deafness. He began to experience mild episodes of hearing loss when he was about 28 years old. His hearing loss grew progressively worse until he was left completely deaf at the age of 44. Beethoven continued to compose great works. Contemporaries reported that he placed his ear to the piano while he played in order to sense the vibrations of his compositions. Medical historians are uncertain as to how Beethoven became deaf, although they believe nerve damage and otosclerosis (o-to-skler-O-sis), which damages the bones in the ears, are the likeliest causes. Presbycusis (press-bi-KOO-sis), the most common form, starts gradually for many people when they are in their forties or fifties. More than 50 percent of people age 75 and older have some form of presbycusis. Damage to the cilia (SILL-ee-a), the delicate hairs in the inner ear. Loud noises can damage the cilia, as can poor blood supply to the inner ear resulting from high blood pressure, heart disease, smoking, or poor nutrition. Infections, tumors, and some medications also may damage the cilia and nearby parts of the inner ear or nerves to the brain. Genetic disorders may cause deafness from birth by interfering with the proper development of the inner ear or nerves to the brain. Injuries to the ear or head, such as a skull fracture, may cause sensorineural hearing loss. Meniere's (men-YERZ) disease affects more than 3 million people in the United States, many of them between the ages of 30 and 60. It can cause sensorineural hearing loss, vertigo and dizziness, and a ringing in the ears called tinnitus (ti-NY-tis). Mixed hearing loss involves any combination of conductive hearing loss and sensorineural hearing loss. For example, loud noise can damage the ear drum, which would cause conductive hearing loss. But loud noise also can damage the hairs in the inner ear, which would be sensorineural hearing loss. If both occur, people are said to have mixed hearing loss. Hearing loss or deafness that is present from birth usually is first discovered by parents. They might begin to notice that loud sounds do not startle the baby or cause the baby to turn toward them. By school age, all children should have had their hearing tested, either by the family doctor or in school. Hearing loss at later ages often is not recognized at first. People may find they can hear almost as well by increasing the volume on the television set or by moving closer to someone who is speaking, but they may not realize they are doing these things. Other signs of hearing loss include needing people to repeat what they have said; complaining that other people are mumbling; misunderstanding what people have said; and not hearing the phone, doorbell, or voices calling from other rooms. Often, the voices of women and children cause earlier problems, because the hair cells that recognize their higher-pitched voices are the first to fail. Loud music is fun but it can damage the hair in the inner ear and lead to permanent hearing loss. It can be a special problem for those who listen to music through earphones. Even two hours of loud music can damage the ear. Doctors advise those who listen to music to keep the volume at a level where other sounds and conversation still can be heard. If other people can hear the music from earphones, then it is too loud to be safe. At concerts, ear plugs can lower damaging sound levels. The same advice about protecting the ears applies to those who work regularly with loud machines, including power tools, lawn mowers, and leaf blowers. Doctors use several tests to diagnose hearing loss. One involves patients listening on earphones for a variety of tones and signaling when they are heard and when they disappear. A related test involves a special device that is placed behind the ear and transmits tones directly to the inner ear through the skullbone called the mastoid. If these tones are recognized better than those from the earphone test, it usually means the hearing problem is in the middle ear. Another test involves understanding various words as they are spoken through earphones. Treatment for ear wax buildup or infections can reverse some forms of hearing loss. Surgery to repair damaged ear drums or the bones of the middle ear also is possible. The most common device used to amplify sound is the hearing aid. Aids come in various forms that fit in or behind the ear and can help make sounds louder and clearer. They cannot completely restore lost hearing, but they can make it easier for many people to hear sounds. Audiologists are trained specialists who help select, fit, and monitor the use of hearing aids for both children and adults. A cochlear (KOKE-lee-ar) implant is a complex device that replaces the work of the delicate hair cells (cilia) of the inner ear. A receiver worn behind the ear captures sound waves and transmits them to a receiver that is surgically placed inside the skull. This receiver then stimulates the nerves that the brain uses to interpret sounds. The surgery can be expensive, and it does not work for everyone, but for some it can be an effective way to partially restore hearing. Closed caption televisions that display words as people speak. Lights that flash when the phone or doorbell rings. Enhanced telephone services and telephones. Dogs trained to alert their human companions to sounds, like the phone ringing, a baby crying, or the person's name being called. Many people with deafness and hearing loss take pride in the many ways that deafness education and deaf culture enrich the lives of people who can hear. Carmen, Richard. Consumer Handbook on Hearing Loss and Hearing Aids: A Bridge to Healing. Auricle Ink Publishers, 1998. Turkington, Carol A. The Hearing Loss Sourcebook: A Complete Guide to Coping With Hearing Loss and Where to Get Help. New York: Plume, 1997. U.S. National Institute on Deafness and Other Communication Disorders, National Institutes of Health, 31 Center Drive, MSC 2320, Bethesda, MD 20892-2320. NIDCD publishes brochures, posts fact sheets, provides referrals to other organizations, and offers a Kids and Teachers section at its website. American Speech-Language-Hearing Association, 10801 Rockville Pike, Rockville, MD 20852. American Society for Deaf Children (ASDC), P.O. Box 1510, Olney, MD 20830-1510. ASDC supports parents and families of deaf children and the professionals who work with them, stressing the use of sign language in the home, school, and community. H.E.A.R. (Hearing Education and Awareness for Rockers), P.O. Box 460847, San Francisco, CA 94146. Information on safe volume levels for music, and on ear plugs for both musicians and fans. I think you should add more information about how babies are born deaf because of its parents both being deaf (genes) or because of its mother being sick with something like rubella.